For step counting, a good accelerometer pedometer such as the tri-axis Omron HJ-321 will work just fine. It is inexpensive yet has a highly accurate tri-axis accelerometer mechanism and can be carried in a pocket or pack or worn on your waistband. On a hike, you are probably more likely to be bending and twisting and leaning than on a fitness walk. An accelerometer with two-axis or three-axis accuracy will give a better count than an old-style pendulum mechanism. You may want a pedometer or activity monitor that has a workout tracking function or that you can reset to zero so you are only tracking your hike rather than your total daily steps. The Omron GoSmart HJ-203 has an Action button to use to record specific workouts, in addition to total daily steps. For hiking, you also want a pedometer that is smart enough to edit out jiggles and not count them as steps. Cheap pedometers often don't do that. Pedometers are only as accurate as you are in estimating your average stride length. Your stride length is likely to vary a lot during a hilly hike vs. a walk on an even surface. You don't want to use a pedometer's distance estimate if your life is going to depend on "turn left at the fork in 1.4 miles." That said, soldiers are trained to count their steps on survival navigation courses and use that for distance estimation. It can be a good estimate, but you probably will be taking shorter steps as you go uphill or negotiate rocky and rooted trails than you would on fitness walk on an even surface. Going downhill, your stride may be a few inches longer. You may want to experiment on trails that have distance markers and adjust your stride length setting accordingly. Set it shorter if you are logging more distance than the marker indicates, longer if you are logging less distance than the marker indicates. A GPS unit or sensor in your mobile phone should give you better distance accuracy, with many caveats. It really depends on how well your GPS unit can access the satellites throughout your hike. If you are in hills and valleys or in dense forest, your unit may lose the signal or switch from satellite to satellite. You can see grossly inaccurate GPS distance and speed readings from your cell phone or other GPS when you walk in a ravine or next to an embankment that blocks most of the southern sky. The signal switches from satellite to satellite and it thinks you are hopping back and forth a quarter mile at a time. A dedicated hiking GPS unit is best if you want accuracy, especially if your life depends on it. However, these usually don't do step counting, so if you want your step count, wear a pedometer as well. Calories are likely to be underestimated with a pedometer when you are hiking up and down hills. Each 1% increase in grade burns 12% more calories per mile. Very few pedometers include an altimeter, which provides data that might be used to increase the calories burned. The Fitbit does, as does the Striiv. Both are more expensive, but both also have the ability to track specific workouts and are two of my favorite pedometers to own and use every day. Hiking is generally estimated as burning more calories per mile because the term "hiking" assumes hills and difficult terrain, but a pedometer without an altimeter doesn't know you are hiking. 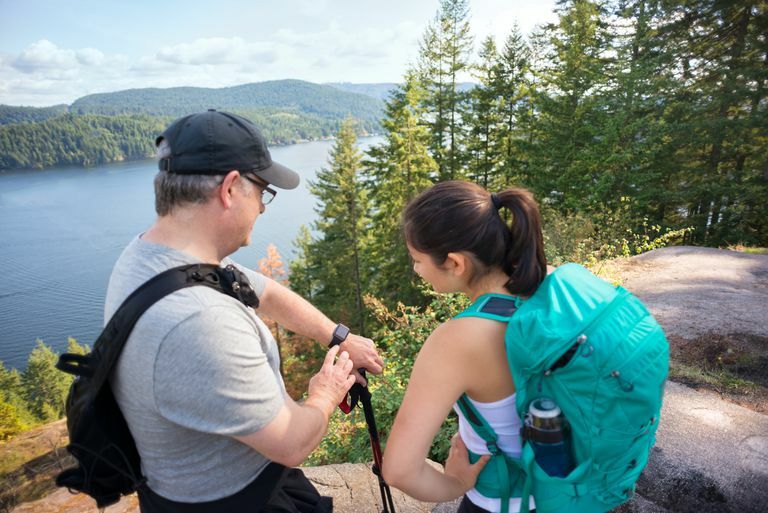 You may also be going slower on a hike than you do on a walk, which may mean the pedometer estimates even fewer calories, or may not record aerobic minutes or aerobic calories burned. If you don't want your pedometer to pop off your waistband and disappear into the great outdoors, be sure to add a pedometer safety leash to it. If you don't have one already, you can make your own with string and a safety pin. If you are going to carry the pedometer in a pocket, use a pocket that closes with a button, zipper, or velcro.